When I received The Eli’s Cheesecake Cookbook, I had no idea what was in store. Sure, I figured there would be recipes, but I have to tell you that I was floored at the in-depth description of the art and science of making cheesecake presented in the beginning of the book. It makes for fascinating reading. I have never seen cheesecake discussed in such depth and all I can say is Thank You to the authors! Every cheesecake lover and baker needs to read what they have to say. The authors are truly interested in sharing their deep knowledge; they want you to succeed! 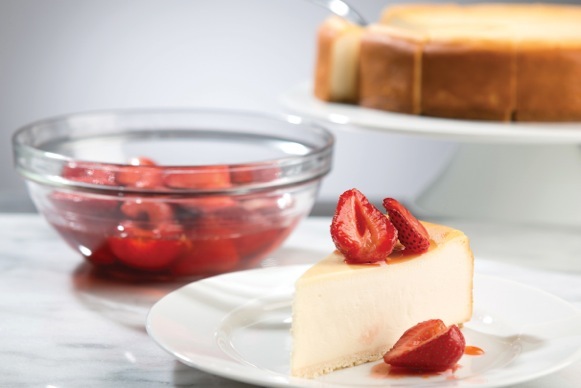 They have brought us this recipe for their Original Cheesecake with a colorful and flavorful optional strawberry compote. If you are an armchair cookbook reader, you are going to love this book for its front matter alone. And of course, having the real Eli’s recipes is a huge bonus. Reprinted with permission from The Eli’s Cheesecake Cookbook by Maureen Schulman, Tara Lane, Diana Moles, and Jolene Worthington, Agate Midway, 2015. Photo © Peter McCullough, courtesy of Agate Publishing. For the Crust: Note that the yield for the crust recipe is as follows: 2 (8- OR 9-INCH) SPRINGFORM BOTTOM CRUSTS, 4 (6-INCH) SPRINGFORM BOTTOM CRUSTS, 1 (9-INCH) TART CRUST WITH CRUST UP THE SIDES, 18 (1B/c-INCH) TARTLET PANS, 12 (3-INCH) TART PANS. You only need one 9-inch crust for this cake. In the bowl of a stand mixer fitted with the paddle attachment, cream the butter and confectioners’ sugar until the mixture is light and fluffy. Add the salt and vanilla and beat on low speed until the mixture is fully incorporated. Add the flour and beat on low speed until the mixture is fully incorporated and the dough comes together. Shape the dough into a disc. Wrap in plastic and refrigerate for 2 hours. On a lightly floured surface, roll out the dough to ¼-inch thickness. Use the pan(s) as a template and trim the dough to fit the pan(s). Grease the pan(s). Carefully lay the disc(s) of dough inside the pan(s) and press down, fitting evenly. Using a fork, dock the dough to ensure even baking. Place the pan(s) in the center of the oven, directly on the middle shelf. Bake for 12 to 15 minutes, until golden brown. Remove from the oven and set aside to cool to room temperature, about 1 hour. For the Compote: Macerate the strawberries by placing them in a large mixing bowl and sprinkling the sugar, lemon juice, and zest over them. Stir well, cover the bowl with plastic wrap, and set aside at room temperature for 2 hours, until the compote has taken on an intense red color and its flavor is very sweet. For the Cake: In the bowl of a stand mixer fitted with the paddle attachment, beat the cream cheese on medium speed for 2 to 3 minutes, until it is light and fluffy. Scrape down the sides and bottom of the stand mixer bowl to prevent lumps from forming. In a separate medium mixing bowl, combine the sugar, cake flour, and salt. Stir until well combined. Add the contents of the medium mixing bowl to the bowl of the stand mixer and beat on medium speed for 1 minute. Scrape down the sides and bottom of the stand mixer bowl and continue beating on medium speed for 1 to 2 minutes, until the mixture is smooth and creamy. Reduce the mixer speed to low. Slowly add first the whole eggs and then the egg yolk to the bowl, one at a time. After adding each, scrape down the sides and bottom of the bowl. Continue beating on low speed for 1 to 2 minutes, until the mixture is fully incorporated. Add the sour cream and the vanilla to the bowl of the stand mixer and beat on low speed for 1 minute, until the mixture is smooth. The mixture should be well blended, but not overeaten. Preheat the oven to 375ºF. Generously grease and flour the springform pan. Fill the springform pan with the Original Plain batter. Bake for 15 minutes more, and again rotate the cake 180 degrees. The cake should be starting to soufflé and should be light in color. Continue to bake for 10 minutes more, for a total of 40 minutes at 375ºF. Reduce the oven temperature to 250ºF and leave the oven door slightly ajar. The cake should be golden brown and lightly souffléd on the sides. Leave the cake in the oven for 10 minutes more. (This step and the two that follow allow the cake to cool to room temperature gently, preventing cracking.) Give the cake a gentle shake; it is done if the center of the cake jiggles and the surface of the cake is slightly firm. Turn the oven off and open the oven door wide. Leave the cake in the oven for 10 minutes more. Remove from the oven and set aside to cool to room temperature, about 1 hour. Loosen the cheesecake from the springform pan by sliding an offset spatula around the inside ring. Remove the springform pan from the cake and transfer to a plate. Refrigerate for at least 8 hours or overnight before serving. Transfer to the freezer for 2 to 3 hours before slicing. Slice the cake with a thin, nonserrated knife that is dipped in hot water and wiped dry after each slice. Serve immediately with the Strawberry Compote or store in the freezer well wrapped for up to 3 months. Want to make your strawberry cheesecake a little more interesting? Add chopped fresh basil to the strawberries in the Strawberry Compote after they’re macerated, right before you serve.